Last week I blogged on national trends with the opioid epidemic. Georgia data tracks national trends, and unfortunately, seems to be leading the nation in opioid overdoses. A 2017 research paper from the Georgia Prevention Project tracked the following data. Of the 1,307 drug overdose deaths in 2015 in Georgia, 900 or 68 percent were due to opioid overdoses including heroin. 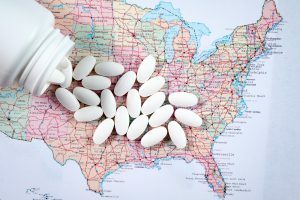 Georgia ranks among the top 11 states with the most prescription opioid overdose deaths. Recent data indicate that 55 of Georgia’s 159 counties had higher drug overdose rates than the U.S. average. Sixty percent of the 55 counties with drug overdose rates higher than the national average are located in rural areas with limited access to substance use disorder treatment and/or medication-assisted treatment. What is Georgia doing about the opioid epidemic? You can read more about the steps Georgia is taking to prevent opioid addiction and overdose at the Governor’s website. Georgia funds specific programs that focus on education and training on opioid use as well treatment and recovery programs for those addicted to heroin or opioids. We should see the General Assembly in the 2018 session address the opioid epidemic. Some legislators have suggested tapping into available federal Medicaid dollars for help with this epidemic. Georgia did pass a Medical Amnesty Law which grants anyone who calls to report a drug overdose protection from prosecution. Last year the Georgia General Assembly passed licensing requirements on drug treatment facilities and made Naloxone/Narcon (the emergency anti-overdose drug) more readily available. More legislation is expected this session. Tagged: "Georgia Opioid Epidemic", "Medical Amnesty Law" and "overdose death"